Appalachian Ski Mountain is OPEN from 9 AM - 5 PM on 8 slopes and 2 terrain parks with 5 lifts on a base of 10 - 20 inches. Natural snowfall. Night skiing fro 5 - 10 PM. Ice Skating is open for regular sessions. Cataloochee Ski Area is OPEN from 8:30 AM - 4:30 PM - 9 slopes with 4 lifts on a base of 24 - 42 incheswith 3-5 inches of natural snowfall. Cataloochee will also be serving Thanksgiving turkey dinner with all the trimmings beginning at 11:30 AM on Thanksgiving Day. The cost for the dinner is $10.75 plus tax. Sugar Mountain Ski Resort is OPEN 9 AM - 4:30 PM - 5 slopes with 2 lifts on a base of 10 - 42 inches for day and night skiing and boarding. Ice Skating is open. 4+ inches of natural snowfall. Thenksgiving Turkey Treat: For one low price, you can ski/ride any four sessions during the four days of the Thanksgiving weekend. Get a link for details about all NC ski Resorts and Areas on the NC Resort Guide. Appalachian Ski Mountain will open for the 2013-2014 Season on Wednesday, November 27. Opening Day 2013 will offer more terrain and a deeper base than ever before in Appalachian's history. The 52nd season will begin bigger and better than ever before with riding on 9 slopes, including 2 terrain parks. Ice Skating will also be open on the regular schedule Wednesday November 27, with 3 sessions from 12 - 2 PM at 2:30 – 4:30, and 7-9 PM. The first 100 guests to the ticket cashier window on opening day receive a free ski ticket. The Opening Weekend Contest is scheduled for Saturday, November 30. Don’t miss the action and your chance to win a bunch of prizes including some CASH. Thanksgiving Day Hours: The Slopes will be open 9 AM – 5 PM. Ice Skating will offer 2 sessions from 12-2 PM, and 2:30-4:30 PM. November 29 - 30 come enjoy Appalachian's Thanksgiving Midnight Blast. The slopes open until Midnight on both Friday and Saturday night. Get a link for Appalachian Ski Mountain and all the NC ski slopes on the NC Ski Resort Guide. Cataloochee Ski Area is OPEN - 9 slopes with 3 lifts on a base of 18 - 35 inches for day skiing until 4:30. 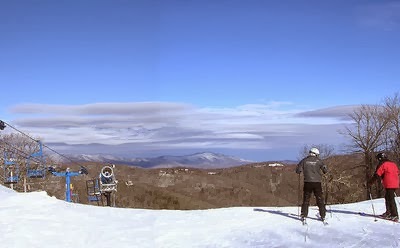 Sugar Mountain Ski Resort is OPEN - 5 slopes with 2 lifts on a base of 8 - 34 inches for day and night skiing and boarding. Ice Skating is open. Wolf Ridge Ski Resort is CLOSED with snowmaking in process. Sapphire Valley Ski Area is CLOSED. 11/28-12/1 Thanksgiving Turkey Treat at Sugar Mountain Ski Resort Spend your Thanksgiving on the Sugar Ski Slopes this year. For one low price, you can ski/ride any 4 sessions during the the 4 days of the Thanksgiving weekend for just $115. This offer expires Monday, November 25, 2013 at 3 PM. If the Sugar Slopes are not open because of weather, you can ski/ride any 4 non-holiday weekdays throughout the year. To purchase your Turkey Treat please call 1-800-sugarmt x261. Get a link for Sugar Mountain Resort and all the NC ski slopes on the NC Ski Resort Guide. Snowmaking has continued since yesterday morning at 1 AM on 3/4 of the mountain down and today Cataloochee will be skiing for one session only, day skiing from 9 AM - 4:30 PM on 4 slopes from midstation down with 2 lifts and 1 conveyor lift operating on a 18-32" base and machine groomed surface. Lift tickets will be $35 for adults and $25 for juniors age 5-12 with the reduced rate continuing through Sunday. Regular rental rates will apply and early season operating hours are 9 AM until 4:30 PM, Monday through Friday and 8:30 AM - 4:30 PM, Saturday and Sunday. There will be no half day rates available at this time, but they will be again be offering a one run refund. Purchase your lift ticket and make one run and if you are not satisfied after your first run within the first 30 minutes, your money will be refunded for your purchase. Get a link for Cataloochee Ski Area and all the mountain ski slopes on the NC Ski Resort Guide. November 19 - Cataloochee Ski Area in Maggie Valley will be skiing for one session only, day skiing from 9 AM - 4:30 PM on 4 slopes from midstation down with 2 lifts and 1 conveyor lift operating on a 12-24" base and machine groomed surface. Lift tickets will be $35 for adults and $25 for juniors age 5-12 and we will continue this reduced rate through Sunday. Snowmaking has resumed. Sugar Mountain Resort is OPEN with 2 slopes and1 lift on a base of 6 - 30 iinches. Lift/slope ticket prices today are: Adult full day $30; Jr. full day $25; Adult half day $25; Jr. half day $20. Ice Skating is open with sessions at 12pm, 2pm, and 4pm. November 13, 2013 - Sugar Mountain Resort is the first of the NC Ski Slopes to open for the 2013-14 season. Thanks to a sudden cold snap last weekend the Sugar snow machines were able to crank out enough powder to lay the base for skiing and boarding. Get a link for Sugar Mountain and other ski areas on the NC Ski Resort Guide. Cataloochee Ski Area NOW OPEN! November 16, 2013 - Cataloochee Ski Area in Maggie Valley is once again the first of the NC Ski Slopes to open for the season. Skiing will be one session only, day skiing from 8:30am - 4:30pm, on 6 slopes from midstation down with 2 lifts and 1 conveyor lift operating on a 18-36" base and machine groomed surface. Lift tickets are $35 for adults and $25 for juniors age 5-12 with this reduced continues rate through Sunday. Regular rental rates will apply. Early season operating hours are in effect: 9 AM - 4:30 PM, Monday through Friday; 8:30 AM - 4:30 PM, Saturday and Sunday. A one run refund will be offered. Purchase your lift ticket and make one run and if you are not satisfied after your first run within the first 30 minutes, your money will be refunded. Learn more about Cataloochee Ski Area and all the other NC Ski Slopes on the NC Ski Resort Guide. November 9, 7:30 PM to 10 PM - 5th Annual Beech Mountain Ski Resort Season Kickoff Video Premier. An event for all ages who are looking forward to the NC ski, snowboard and winter sports season. See the latest snowboard videos while enjoying great food, drinks and raffles, including a chance to win a season pass to Beech Mountain Resort. Get up to 50% off last season's gear from boots and bindings to boards to outerwear. Take your turn at the spy mini ramp Best Trick Contest and win $100 - no entry fee. The Season Kickoff will be held at The Boone Saloon, 489 West King Street in downtown Boone NC. 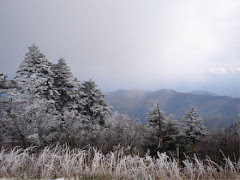 Learn more about Beech Mountain (Ski) Resort and all the NC Ski areas and resorts HERE.